If I would be asked what type of cuisine I am fond of, it would be Thai. 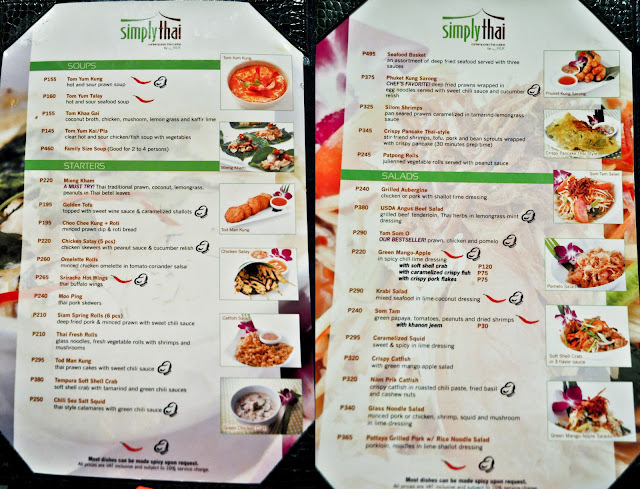 I don't regularly dine in Thai restaurants mainly because Thai choices are quite limited around the Metro unlike other Asian restaurants. 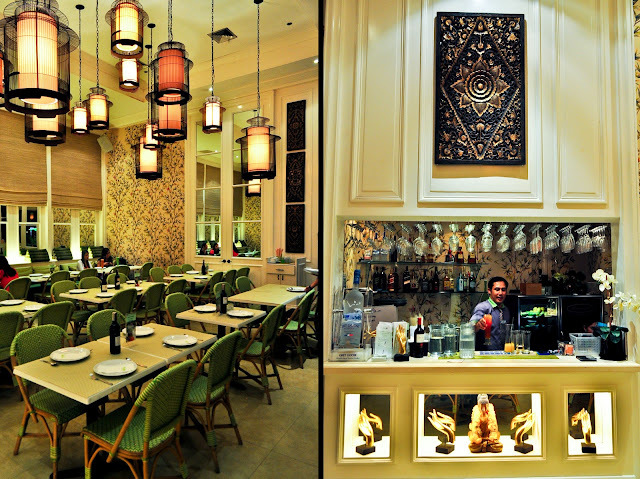 But when I find a new Thai resto in town, I surely won't miss the chance to visit. 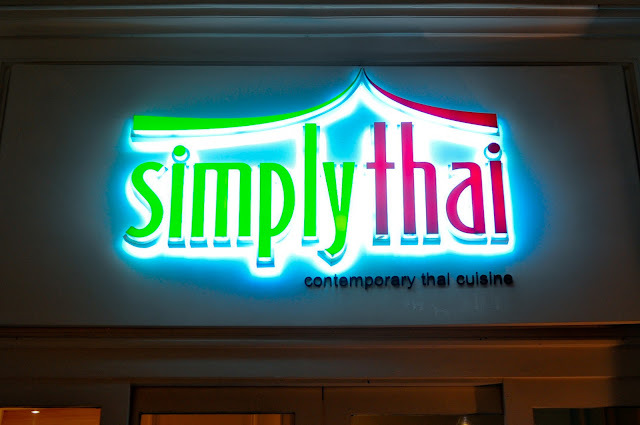 Fortunately, The Foodies Circle decided to go for a contemporary Thai cuisine at Simply Thai in Greenbelt 5. 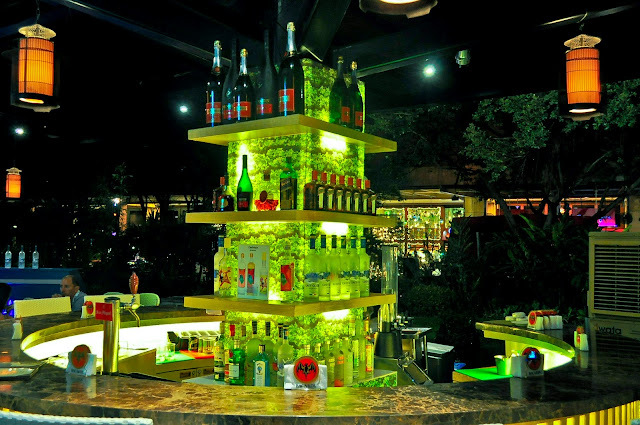 The place is perfect for an evening rendezvous with its sophisticated vibe coupled with green and gold accents. I also love the hanging bird cages that was turned into lamps to illuminate the whole place. Simply Thai's Tom Yum Kung is a creamy, rich and tangy hot and sour soup with prawns. 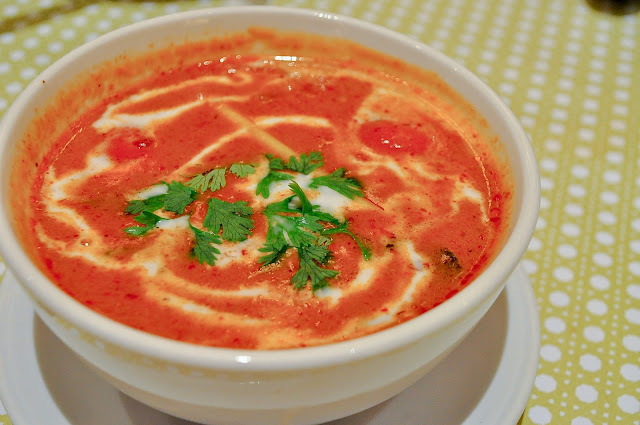 For me good tom yum soup needs to have the perfect balance of sweetness, sourness and spiciness on it and Simply Thai's version hits the spot. The sharp taste of the soup came out too strong at first but the spices and coconut milk balanced the flavors really well. 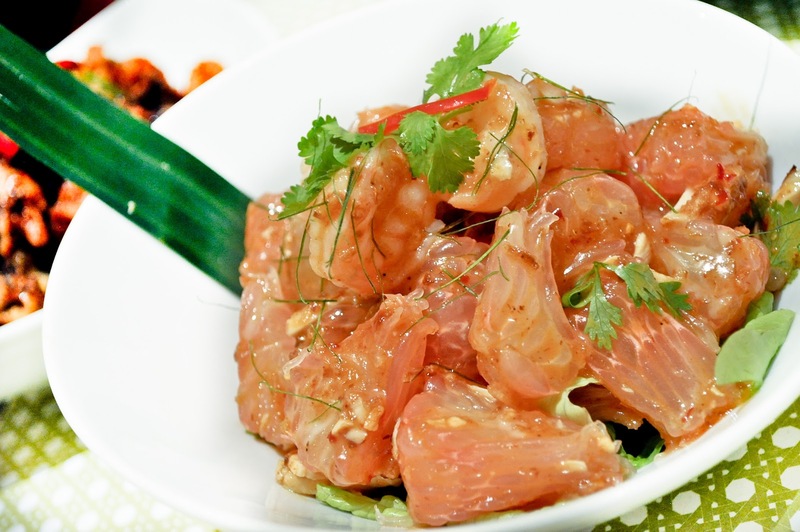 Yam Som O is the best-seller salad of Simply Thai that consists of pomelo, chicken and prawns. It was a refreshing bowl of sweet and juicy pomelo pieces and chunky chicken fillet. First bite and a familiar taste kicked in. 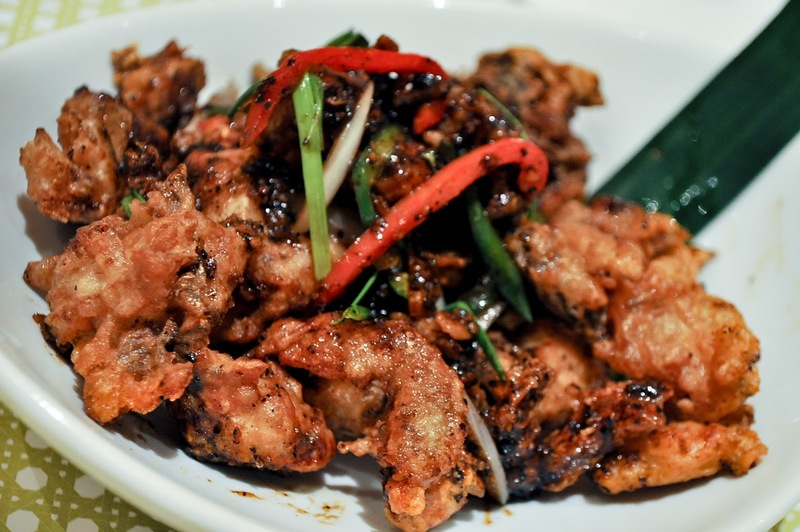 It was like shrimp paste with a subtle hint of coconut that was savory on the palate. My favorite dish of the night! I just couldn't remember how much serving I got of this soft shell crab in black pepper sauce. Every bite was a medley of sweet and peppery glaze with crisp and crunchy texture that was so addicting to munch on. Chiangmai Kao Soi Noodle Soup is a famed bowl of a hearty curry-based noodle soup with your choice of chicken, beef or seafood. Topped with some fresh cilantro leaves, crispy noodles and shallots, this bowl is both pleasing to the eye and the palate. 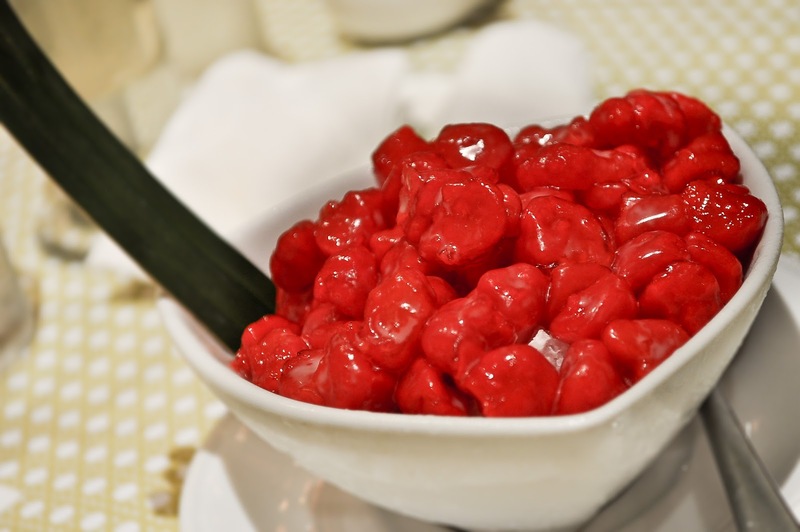 For our dessert, we had the Thap Thim Kwarp or these ruby-colored water chestnuts on shaved ice and coconut cream. The chestnuts were very crunchy to munch on with a light and clean taste. I'm a fan of Thai dishes but I haven't tried much of their desserts. 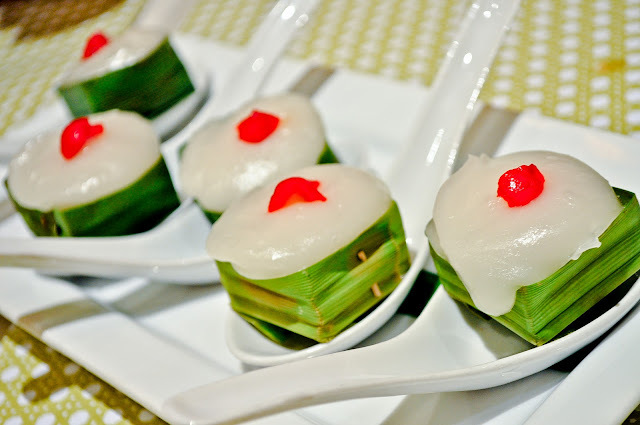 Fortunately, we were able to try the Takhoo Sakhoo or these tapioca pearls steamed cakes in small and fresh pandan cups. It was a sweet and delicately soft pudding with small tapioca pearls underneath that somehow melts in your mouth despite its sticky nature. 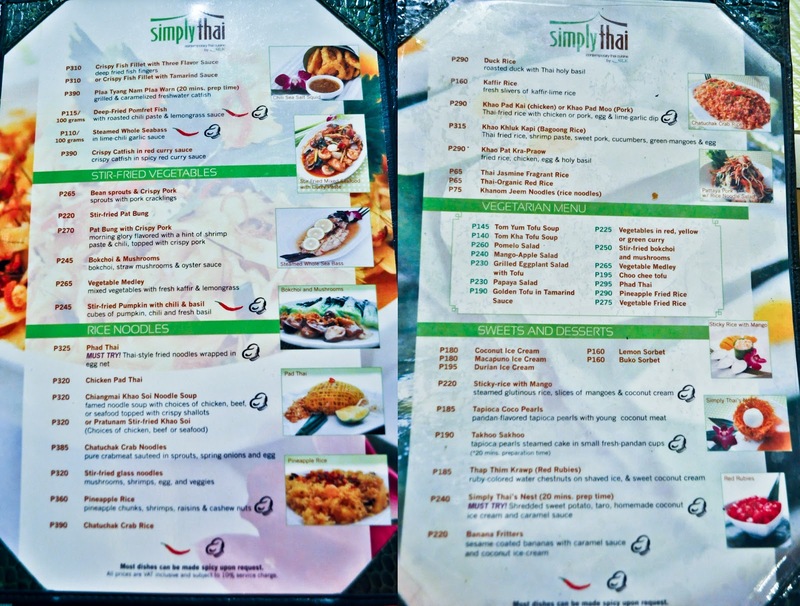 Simply Thai offers refreshing beverages like the Pandan Juice and Lemongrass Juice that are both equally light and clean to the palate. It could be a great drink to contrast the sharp and strong flavors from all the Thai dishes and at the same time neutralize the taste buds. 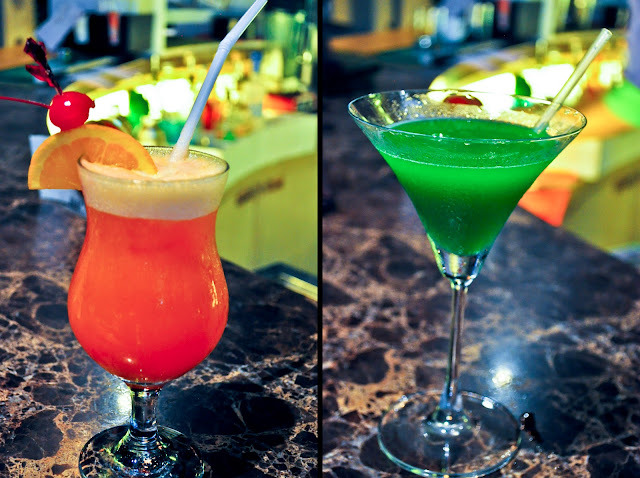 It is advisable to pour some syrup into the drinks as they are naturally unsweetened. Not a fan of unsweetened drinks? Then try Simply Thai's Green Tea Milk Tea that is sweet and creamy with a hint of grassy taste that takes a while to appreciate. 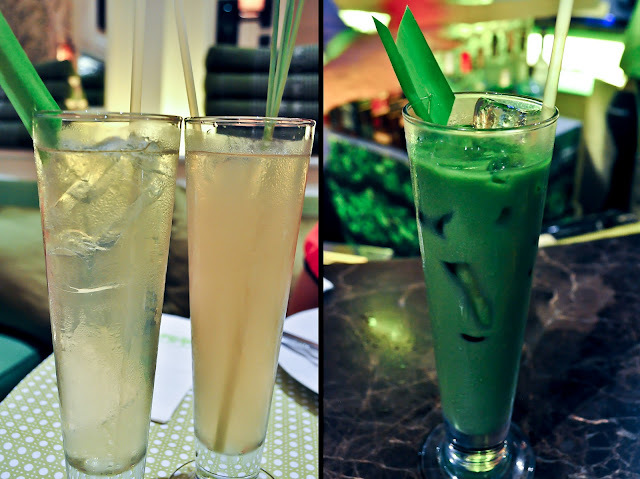 Maybe I was used to Taiwan's version of green tea milk tea and not to Thai's version. After dinner, we settled on the bar area outside for some of Simply Thai's cocktail creations. 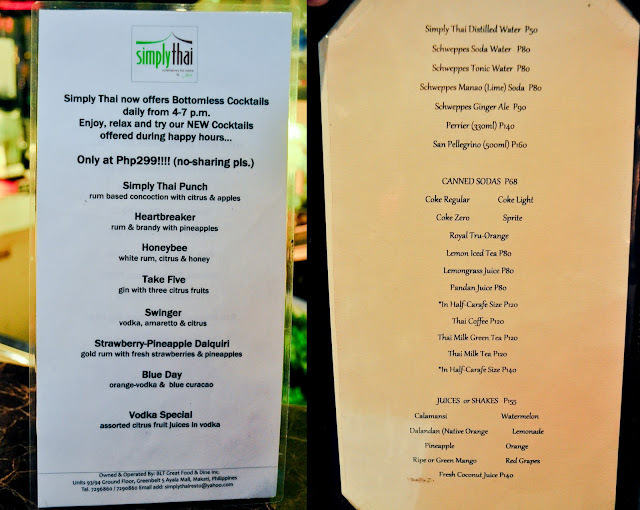 Simply Thai also offers bottomless cocktails daily from 4pm-7pm for just P299! We tried 2 of their signature cocktails Simply Thai Punch- a rum based concoction of citrus and apples and Blue Day- a mix of orange-vodka and blue curacao. 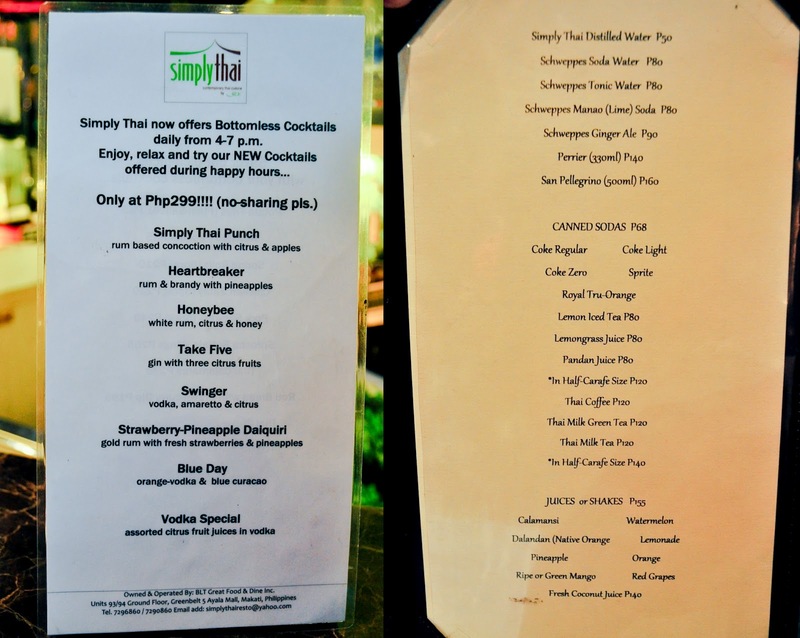 Personally, I prefer the Simply Thai Punch that was a lot sweeter and fruitier than the Blue Day. Simply Thai is a restaurant that offers modern Thai dishes that definitely suits the Filipino taste. Aside from the elegant and cozy ambiance perfect for a small gathering or intimate chit chats, the dishes will surely delight everyone's taste buds. I've tried this place once before. Had a good experience. :) The Soft Shell Crab looks SO GOOD. I'm going to have to note down to get that if I have another chance to eat here. BTW, love your pics! I haven't been active in the blogosphere, and I can definitely say that your shots have become even better from the last time I visited your page! 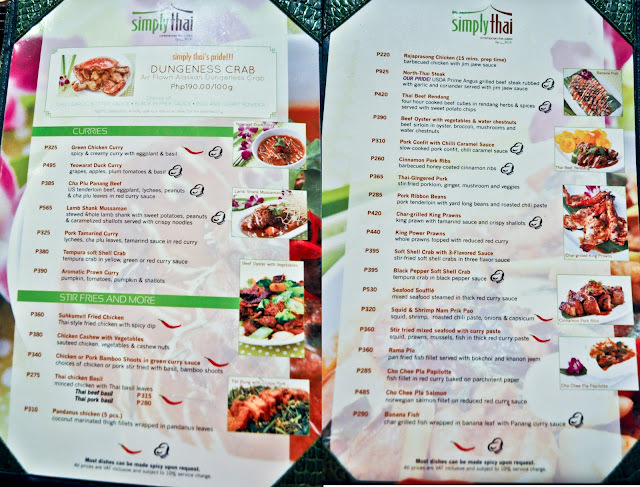 Can't wait to visit back Simply Thai! 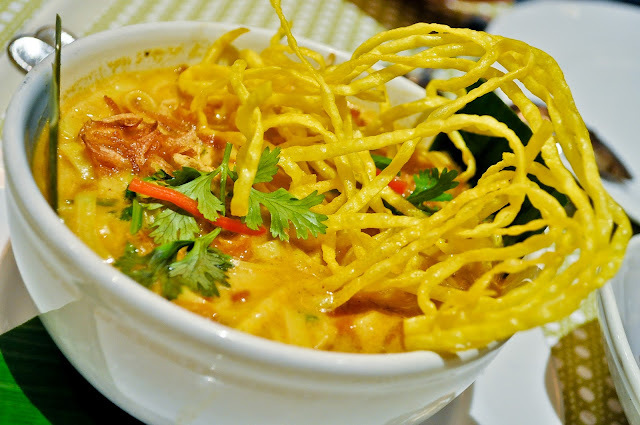 :) I like their Chiangmai Kao Soi noodle soup and will definitely return just to get a taste of it again. Wow I love thai food.